On June 10 tragedy struck when an accident claimed the lives of Ben, Charlie and Bailey Bartlett. We invite you to come hear Dave Bartlett share from his heart what his family is learning about grief, pain and the presence of God. 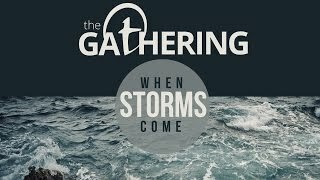 “When Storms Come” will provide insight into their story and the ways God has been present. It will challenge us to count our blessings and make our lives count. Are you going through a storm? Do you know someone currently going through a storm? Don't miss this year's Gathering. Bring a friend.